Video abstract presented by Mário Ginja, Ana Rita Gaspar, and Catarina Ginja. Abstract: Canine hip dysplasia (CHD) is the most common inherited polygenic orthopedic trait in dogs with the phenotype influenced also by environmental factors. This trait was described in the dog in 1935 and leads to a debilitating secondary hip osteoarthritis. The diagnosis is confirmed radiographically by evaluating signs of degenerative joint disease, incongruence, and/or passive hip joint laxity. There is no ideal medical or surgical treatment so prevention based on controlled breeding is the optimal approach. The definitive CHD diagnosis based on radiographic examination involves the exposure to ionizing radiation under general anesthesia or heavy sedation but the image does not reveal the underlying genetic quality of the dog. Phenotypic expression of CHD is modified by environmental factors and dogs with a normal phenotype can be carriers of some mutations and transmit these genes to their offspring. Programs based on selection of dogs with better individual phenotypes for breeding are effective when strictly applied but remain inferior to the selection of dogs based on estimation of breeding values. Molecular studies for dissecting the genetic basis of CHD are ongoing, but progress has been slow. In the future, the recommended method to improve hip quality in controlled breeding schemes, which will allow higher selection pressure, would be based on the estimation of the genomic breeding value. Since 2012, a commercial DNA test has been available for Labrador Retrievers using a blood sample and provides a probability for development of CHD but we await evidence that this test reduces the incidence or severity of CHD. Canine hip dysplasia (CHD) is the most common inherited polygenic orthopedic trait with the phenotype influenced by environmental factors.1 This trait was described in the dog in 1935, in the USA, and leads to a debilitating secondary hip osteoarthritis.2 Heritability estimates for CHD vary from 0.1 to 0.83,3,4 due to different pedigrees, methods used to calculate the heritability, and the hip phenotypes analyzed.5 CHD is more prevalent in large and giant breeds of dogs often resulting in mild or no clinical signs.1,6 However, for some dogs clinical signs can be severe and resistant to medical management needing aggressive and expensive surgical treatments.1,7 The definitive diagnosis of CHD is made if characteristic radiographic signs are evident on a standard or stressed ventrodorsal view of the pelvis, occurring along a gradual scale from nearly normal to severely affected.1 This is a crucial aspect of CHD as the radiographic diagnosis has been essential for the selection of breeding stock.1 Studies attempting to find genetic markers for CHD diagnosis are now frequent.8–11 The sequencing and annotation of the canine genome has resulted in renewed interest in research of the genetic underpinnings of canine orthopedic disorders, particularly those of a multifactorial etiology, such as CHD.12 Recently, the first commercial CHD diagnostic genetic test for Labrador Retrievers appeared,13 but, the imaging diagnosis continues to be of major importance for disease screening and treatment. Humans are also affected by hip dysplasia and both conditions have phenotypic similarities of joint subluxation and the development of osteoarthritis.14 However, the main medical approach in humans is different, being mainly based on the preventive management and with good results.1,15 Currently, molecular CHD studies are considered useful for the understanding of the genetic basis of analogous conditions in humans, mainly because the heterogeneity in human populations and the complexity of this disorder makes the genetic dissection of human hip osteoarthritis more difficult.12 The main purpose of this review is to present and discuss medical aspects of CHD for which knowledge is incomplete and have therefore merited major current research efforts. Figure 1 Ortolani test performed with the dog in lateral recumbency. Notes: The hip is positioned in a neutral position with the femur parallel to the table and firm pressure is applied along the long axis of the femur (arrow), which causes subluxation of the femoral head when there is increased hip joint laxity (A). While still applying proximal force, the limb is slowly abducted (arrow), and the femoral head brought back into position within the acetabulum eliciting a typical palpable and/or audible clunk (B). Radiography is the reference technique for the definitive diagnosis of CHD from its first description in 1935. This imaging technique uses different radiographic views of the hip joint for genetic screening purposes or for diagnosis and treatment of dogs with clinical CHD. All these radiographic techniques should be performed under anesthesia or heavy sedation, which facilitates accurate positioning and elicitation of passive HJL.1,3,7,19 Given the complexity of the topic and the objectives of this review, we will cover particularly the radiographic studies used for genetic screening of CHD, which are used to detect HJL, the major risk factor for CHD, or signs of DJD. In the Flückiger method, the HJL is estimated with the subluxation index in a similar manner to the DI.28 The stress in hip joints is caused by the dorsocranial force exerted by the examiner, with the dog in dorsal recumbency.28 No follow-up studies were published and the research was performed in adult animals together with the SVDV to better assess the quality of the hips. The half-axial position method was used by positioning the dog and performing the hip stress similar to the PennHIP, using a trapezoidal-shaped distractor.22 The HJL measures using this method are performed mainly with the purpose of early CHD diagnosis and treatment, using the juvenile pubic symphysiodesis (JPS). Notes: FCI’s hip dysplasia grading in five categories using as reference the worst hip; OFA hip dysplasia grading in seven categories using as reference the worst hip; BVA/KC hip dysplasia score resulting from the sum of both hips, each hip joint is scored between 0 and 53 based on the severity of nine morphological radiographic changes resulting from laxity and degenerative joint disease, with each change scored from 0 (normal) to 6 (worst); Switzerland, the worst joint defines the score of hip dysplasia for the dog, each hip joint is scored between 0 and 30 based on the severity of six morphological radiographic changes resulting from laxity and degenerative joint disease, each change is scored from 0 (normal) to 5 (worst). Abbreviations: CHD, canine hip dysplasia; FCI, Fédération Cynologique Internationale; OFA, Orthopaedic Foundation for Animals; BVA/KC, British Veterinary Association/Kennel Club. Femoral head and neck excision reduces the pain produced by abnormal bone to bone hip joint contact, but it does not effectively maintain the full range of hip motion and limb function. The total hip replacement is the best treatment to preserve long-term limb functionality. In a normal congruent hip joint, the normal weight bearing force is transmitted between femoral head and acetabulum across the surface of the articular cartilage. The joint incongruence favors the reduction of contact between the cartilaginous surfaces, the early destruction of chondrocytes by increasing pressure and the cyclic cascade of osteoarthritis. Small synovial joint volume and low intracapsular pressure, high pelvic muscle mass, and a reduced level of the hormones that promote soft tissue relaxation maintain stability and prevent the development of CHD signs.26 The HJL is the primary risk factor, well-evaluated in a radiographic study that is associated with CHD development.40 Acetabular and proximal femoral head and neck conformation is directly associated with the magnitude of transmitted hip forces.41 So, genetic factors associated with CHD can be related to hip conformation, cartilage susceptibility to pressure forces, joint soft tissues or even to hormonal factors. 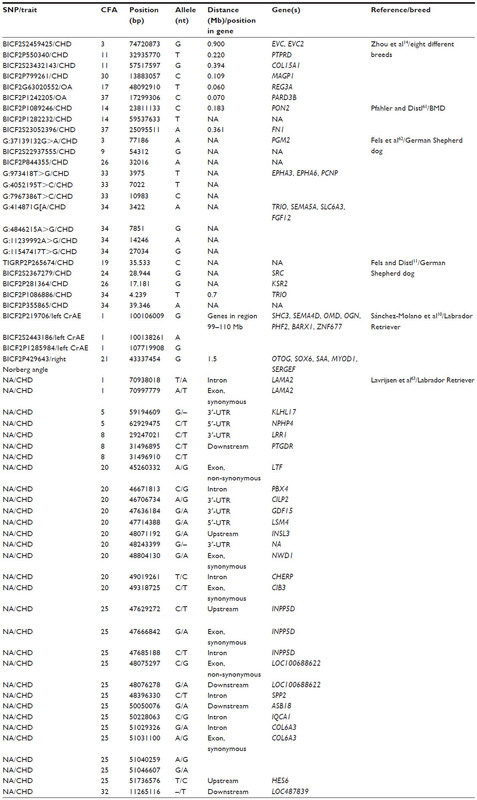 With the rapid development of high-throughput sequencing technology and emergence of high-density genome-wide single nucleotide polymorphisms (SNPs) canine arrays, associations between genetic markers in linkage disequilibrium and CHD genes have been discovered.14,42 The molecular genetic information can be applied for CHD selection purposes, particularly if the most informative SNPs are used to estimate the genomic breeding value (GBV) of an individual. Such genomic selection was successfully applied in livestock animal breeding programs and can be used for selection against prevalence of undesired traits with greater genetic improvement.10,42,43,53 In the near future, GBV might become the recommended method to improve hip quality in CHD control schemes.12,43,53 In a particular dog breed, pedigree and phenotypic data can be used to obtain EBV and combined with genomic data to derive a predictive formula for the GBV.12 Then, the genotyping of a puppy for a set of informative SNPs can be combined with radiographic information, and used to determine the susceptibility to CHD and make decisions regarding breed management. However, the QTL region may contain hundreds of genes and the identification of genes remains problematic.4 The strategy that is followed by some researchers is to refine the QTL interval using SNPs and across-breed-mapping thus reducing the linkage disequilibrium interval.4 Unrelated affected animals with CHD probably share more common disease alleles than an unaffected dog population.4 The associated SNPs might be physically next to the responsible gene.14 GWAS consider the joint effect of multiple SNPs, being much more effective than individual SNP analysis, in the identification of common genetic variants for complex diseases.14 In eight different dog breeds using GWAS, four SNPs were significantly associated with CHD on CFA3, 11, and 30, and two with osteoarthritis on CFA17 and 37.14 In German Shepherd dogs, 13 SNPs were also associated with CHD on chromosome CFA14 and 37,61 CFA19, 24, 26, and 34,11 and CFA3, 9, 26, 33, and 34.62 In other recent studies on Labrador Retrievers, four SNPs were associated with CHD on chromosome CFA1 and 21,10 and 31 SNPs on CFA1, 5, 8, 15, 20, 25, and 32 positioned within or in the vicinity of 24 different genes (Table 2).63 Candidate genes involved in hypertrophic differentiation of chondrocytes and extracellular matrix integrity of basement membrane and cartilage were located in significantly associated regions on CFA1, 8, 20, and 25.63 These results confirm the complex genetic architecture of CHD, based on many genes with small individual effect, which encourages circumspection about a marker-assisted, accurate CHD diagnostic test in the near future. The immediate importance of CHD molecular diagnosis will probably be their use in genomic (many markers assessed for their combined contribution) selection. Notes: Single nucleotide polymorphisms (SNPs) are categorized by traits; gene symbols follow international nomenclature guidelines; distance is shown in Mb. Abbreviations: CHD, canine hip dysplasia; OA, osteoarthritis; CrAE, cranial acetabular edge; CFA, Canis familiaris autosome; bp, position in base pair; nt, nucleotide allele; Mb, megabase; BMD, Bernese Mountain dog; NA, not applicable; UTR, untranslated region. Genetic studies regarding the developmental hip dysplasia in humans were unable to make much progress, so knowledge on the loci-linked hip dysplasia in humans is still limited.12 Despite recent developments in whole-genome analysis in humans, with the finding of a number of genetic variants associated with this condition in affected patients,65,66 understanding the genetics of hip dysplasia in humans can benefit from similar studies in the dog. A DNA-based test for CHD is a desirable tool for early identification of dogs susceptible or resistant to the disease. In 2012, such a test was registered by Bioiberia. Called Dysgen, it was the first commercial marker-based DNA test for susceptibility to CHD in the Labrador Retriever breed. This test analyzes blood samples using a DNA kit containing seven SNPs.13 The Dysgen diagnosis is reported as a prediction, classifying the dog into a risk group for developing CHD – minimal, low, moderate, and high. However, the performance of the Dysgen diagnosis test was not independently tested and there are no published studies reporting its success in the control for CHD at the population level. Breeding of dogs with minimal or low risk of developing CHD is recommended by the manufacturer. This is a first step in the molecular diagnosis of CHD, but until all the genes involved in the disease are detected, CHD control programs continue to require the combination of an accurate phenotype screening, EBV, and the information of available genetic tests. Particularly, if the heritability of the trait is low effectiveness of selection will benefit from combining information on major gene genotypes and EBV. Moreover, if we consider that CHD affects a rather large group of distinct dog breeds, from the Alaskan Malamute to the Portuguese Water Dog and which are raised in different environments, we require a deep understanding of the genetics underlying the incidence of this condition at the population level. Despite phenotypic screening and breeding programs, CHD continues to be one of the most common orthopedic hereditary diseases in dogs. There is no ideal diagnosis or treatment for CHD and reproductive control schemes have been, in the last 50 years, a priority area of veterinary medicine to deal with the disease. The genetic architecture of CHD is complex, as the many associated genes have small individual effect. This fact makes the development of a marker-assisted accurate CHD diagnosis test difficult, despite intensive research worldwide. The molecular diagnosis of CHD will be based on genomic selection until all contributing and critical mutations are identified, and may have a significant impact for a better understanding of the genetic basis of similar conditions in humans. C Ginja received funding from the European Union Seventh Framework Programme (FP7/2007-2013) under grant agreement number PCOFUND-GA-2009-246542 and from the Fundação para a Ciência e a Tecnologia, Portugal, through a Marie Curie/Welcome II fellowship (Ref DFRH/WIIA/15/2011). The authors are grateful to R Todhunter (College of Veterinary Medicine, Cornell University) for expert critical review of the manuscript and helpful comments. The authors declare no conflicts of interest regarding this work. Ginja MM, Silvestre AM, Gonzalo-Orden JM, Ferreira AJ. Diagnosis, genetic control and preventive management of canine hip dysplasia: a review. Vet J. 2010;184(3):269–276. Ginja MM, Silvestre AM, Colaço J, et al. Hip Dysplasia in Estrela mountain dogs – prevalence and genetic trends 1991–2005. Vet J. 2009; 182(2):275–282. Ginja MM, Silvestre AM, Ferreira AJ, et al. Passive hip laxity in Estrela mountain dog – distraction index, heritability and breeding values. Acta Vet Hung. 2008;56(3):303–312. Zhu L, Zhang Z, Friedenberg S, et al. The long (and winding) road to gene discovery for canine hip dysplasia. Vet J. 2009;181(2):97–110. Silvestre AM, Ginja MM, Ferreira AJ, Colaço J. Comparison of estimates of hip dysplasia genetic parameters in Estrela Mountain Dog using linear and threshold models. J Anim Sci. 2007;85(8):1880–1884. Barr AR, Denny HR, Gibbs C. Clinical hip dysplasia in growing dogs: the long-term results of conservative management. J Small Anim Pract. 1987;28(4):243–252. Manley PA, Adams WM, Danielson KC, Dueland RT, Linn KA. Long-term outcome of juvenile pubic symphysiodesis and triple pelvic osteotomy in dogs with hip dysplasia. J Am Vet Med Assoc. 2007;230(2):206–210. Chase K, Lawler DF, Adler FR, Ostrander EA, Lark KG. Bilaterally asymmetric effects of quantitative trait loci (QTLs): QTLs that affect laxity in the right versus left coxofemoral (hip) joints of the dog (Canis familiaris). Am J Med Genet A. 2004;124A(3):239–247. Todhunter RJ, Mateescu R, Lust G, et al. Quantitative trait loci for hip dysplasia in a cross-breed canine pedigree. Mamm Genome. 2005;16(9):720–730. Sánchez-Molano E, Woolliams JA, Pong-Wong R, et al. Quantitative trait loci mapping for canine hip dysplasia and its related traits in UK Labrador Retrievers. BMC Genomics. 2014;15:833. Fels L, Distl O. Identification and validation of quantitative trait loci (QTL) for canine hip dysplasia (CHD) in German Shepherd Dogs. PLoS One. 2014;9(5):e96618. Breur GJ, Lambrechts NE, Todhunter RJ. 2012. The Genetics of Canine Orthopaedic Traits. In: Ostrander EA, Ruvinsky A, editors. The Genetics of the dog. New York, CABI; 2012:136–160. Plant and Animal Genome XXI [homepage on the Internet]. Sanchez A, Segarra S, Blume V, et al. DNA Test to Evaluate Genetic Predisposition of Labrador Retrievers to Developing Canine Hip Dysplasia: Applications. P0630. Proceedings of the XXI Plant and Animal Genome Conference; 2013. Available from: https://pag.confex.com/pag/xxi/webprogram/Paper6682.html. Accessed December 4, 2014. Zhou Z, Sheng X, Zhang Z, et al. Differential genetic regulation of canine hip dysplasia and osteoarthritis. PLoS One. 2010;5(10):e13219. Wenger DR, Bomar JD. Human hip dysplasia: evolution of current treatment concepts. J Orthop Sci. 2003;8(2):264–271. Riser WH. The dog as a model for the study of hip dysplasia: growth, form, and development of normal and dysplastic hip joint. Vet Pathol. 1975;12(4):244–334. Ginja MM, Ferreira AJ, Jesus SS, et al. Comparison of clinical, radiographic, computed tomographic and magnetic resonance imaging methods for early prediction of canine hip dysplasia. Vet Radiol Ultrasound. 2009;50(2):135–143. Farrell M, Clements DN, Mellor D, et al. Retrospective evaluation of the long-term outcome of non-surgical management of 74 dogs with clinical hip dysplasia. Vet Rec. 2007;160(15):506–511. Vezzoni A, Dravelli G, Vezzoni L, et al. Comparison of conservative management and juvenile pubic symphysiodesis in the early treatment of canine hip dysplasia. Vet Comp Orthop Traumatol. 2008(3);21: 267–279. Lust G, Williams AJ, Burton-Wurster N, Beck KA, Rubin G. Effects of intramuscular administration of glycosaminoglycan polysulfates on signs of incipient hip dysplasia in growing pups. Am J Vet Res. 1992; 53(10):1836–1843. Fry TR, Clark DM. Canine hip dysplasia: clinical signs and physical diagnosis. Vet Clin North Am Small Anim Pract. 1992(3);22: 551–558. Vezzoni A, Dravelli G, Corbari A, et al. The early diagnosis of canine hip dysplasia. EJCAP. 2005;15(2):173–184. Chalman JA, Butler HC. 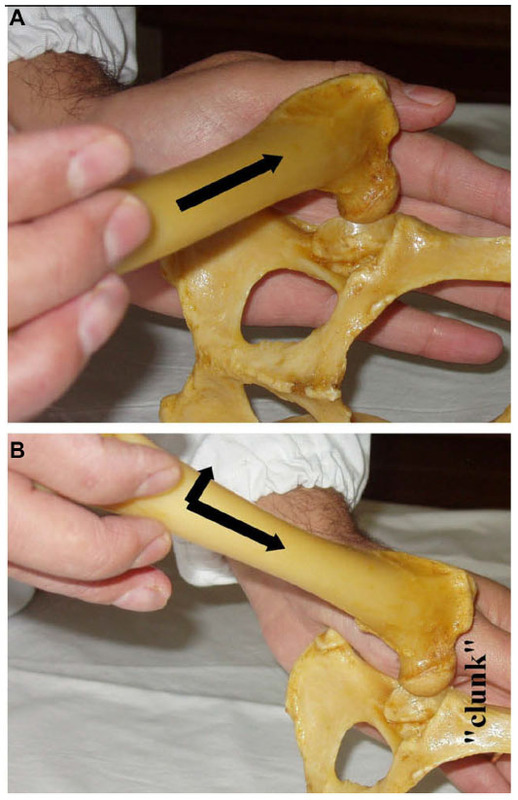 Coxofemoral joint laxity and the Ortolani sign. J Am Anim Hosp Assoc. 1985(6);21:671–676. Ginja MM, Gonzalo-Orden JM, Melo-Pinto P, et al. Early hip laxity examination in predicting moderate and severe hip dysplasia in Estrela mountain dog. J Small Anim Pract. 2008;49(12):641–646. Puerto DA, Smith GK, Gregor TP, et al. Relationship between results of the Ortolani method of hip joint palpation and distraction index, Norberg angle, and hip score in dogs. J Am Vet Med Assoc. 1999;214(4):497–501. Smith GK, Biery DN, Gregor TP. New concepts of coxofemoral joint stability and the development of a clinical stress-radiographic method for quantitating hip joint laxity in the dog. J Am Vet Med Assoc. 1990; 196(1):59–70. Farese JP, Todhunter RJ, Lust G, Williams AJ, Dykes NL. Dorsolateral subluxation of hip joints in dogs measured in a weight-bearing position with radiography and computed tomography. Vet Surg. 1998;27(5):393–405. Flückiger MA, Friedrich GA, Binder H. A radiographic stress technique for evaluation of coxofemoral joint laxity in dogs. Vet Surg. 1999; 28(1):1–9. Corley EA. Role of the Orthopedic Foundation for Animals in the control of canine hip dysplasia. Vet Clin North Am Small Anim Pract. 1992;22(3):579–593. Gibbs C. The BVA/KC scoring scheme for control of hip dysplasia, interpretation of criteria. Vet Rec. 1997;141(11):275–284. Farese JP, Lust G, Williams AJ, Dykes NL, Todhunter RJ. Comparison of measurements of dorsolateral subluxation of the femoral head and maximal passive laxity for evaluation of the coxofemoral joint in dogs. Am J Vet Res. 1999;60(12):1571–1576. Whittington K, Banks WC, Carlson WD, et al. Report of panel on canine hip dysplasia. J Am Vet Med Assoc. 1961;139:791–806. Flückiger M. The standardised analysis of radiographs for hip dysplasia in dogs. Objectifying a subjective process. EJCAP. 1994;2:39–44. Soo M, Worth A. Canine hip dysplasia: phenotypic scoring and the role of estimated breeding value analysis. N Z Vet J. 2015;63(2):69–78. Gerscovich EO. A radiologist’s guide to the imaging in the diagnosis and treatment of developmental dysplasia of the hip. I. General considerations, physical examination as applied to real-time sonography and radiography. Skeletal Radiol. 1997;26(7):386–397. O’Brien RT, Dueland RT, Adams WC, Meinen J. Dynamic ultrasonographic measurement of passive coxofemoral joint laxity in puppies. J Am Anim Hosp Assoc. 1997;33(3):275–281. Kealy RD, Lawler DF, Ballam JM, et al. Evaluation of the effect of limited food consumption on radiographic evidence of osteoarthritis in dogs. J Am Vet Med Assoc. 2000;217(11):1678–1680. Patricelli AJ, Dueland RT, Adams WM, et al. Juvenile pubic symphysiodesis in dysplastic puppies at 15 and 20 weeks of age. Vet Surg. 2002; 31(5):435–444. Johnson AL, Smith SW, Pijanowski GJ, Hungerford LL. Triple pelvic osteotomy: effect on limb function and progression of degenerative joint disease. J Am Anim Hosp Assoc. 1998;34(3):260–264. Smith GK, Popovitch CA, Gregor TP, Shofer FS. Evaluation of risk factors for degenerative joint disease associated with hip dysplasia in dogs. J Am Vet Med Assoc. 1995;206(5):642–647. Weigel JP, Wasserman JF. Biomechanics of the normal and abnormal hip joint. Vet Clin North Am Small Anim Pract. 1992;22(3):513–528. Hou Y, Wang Y, Lu X, et al. Monitoring Hip and Elbow Dysplasia achieved modest genetic improvement of 74 dog breeds over 40 years in USA. PLoS One. 2013;8(10):e76390. Sánchez-Molano E, Woolliams JA, Blott SC, Wiener P. Assessing the impact of genomic selection against hip dysplasia in the Labrador Retriever dog. J Anim Breed Genet. 2014;131(2):134–145. Swenson L, Audell L, Hedhammar A. Prevalence and inheritance of and selection for hip dysplasia in seven breeds of dogs in Sweden and benefit: cost analysis of a screening and control program. J Am Vet Med Assoc. 1997;210(2):207–214. Leppänen M, Mäki K, Juga J, Saloniemi H. Factors affecting hip dysplasia in German shepherd dogs in Finland: efficacy of the current improvement programme. J Small Anim Pract. 2000;41(1):19–23. Leighton EA. Genetics of canine hip dysplasia. J Am Vet Med Assoc. 1997;210(10):1474–1479. Paster ER, LaFond E, Biery DN, et al. Estimates of prevalence of hip dysplasia in Golden Retrievers and Rottweilers and the influence of bias on published prevalence figures. J Am Vet Med Assoc. 2005;226(3):387–392. Mäki K, Liinamo AE, Ojala M. Estimates of genetic parameters for hip and elbow dysplasia in Finnish Rottweilers. J Anim Sci. 2000;78(5):1141–1148. Hou Y, Wang Y, Lust G, et al. Retrospective analysis for genetic improvement of hip joints of cohort Labrador Retrievers in the United States: 1970–2007. PLoS One. 2010;5(2):e9410. Wilson B, Nicholas FW, Thomson PC. Selection against canine hip dysplasia: success or failure? Vet J. 2011;189(2):160–168. Wilson BJ, Nicholas FW, James JW, et al. Genetic correlations among canine hip dysplasia radiographic traits in a cohort of Australian German Shepherd Dogs, and implications for the design of a more effective genetic control program. PLoS One. 2013;8(11):e78929. Malm S, Sørensen AC, Fikse WF, Strandberg E. Efficient selection against categorically scored hip dysplasia in dogs is possible using best linear unbiased prediction and optimum contribution selection: a simulation study. J Anim Breed Genet. 2013;130(2):154–164. Guo G, Zhou Z, Wang Y, et al. Canine hip dysplasia is predictable by genotyping. Osteoarthritis Cartilage. 2011;19(4):420–429. Leighton EA, Linn JM, Willham RL, Castleberry MW. A genetic study of canine hip dysplasia. Am J Vet Res. 1977;38(2):241–244. Todhunter RJ, Acland GM, Olivier M, et al. An outcrossed canine pedigree for linkage analysis of hip dysplasia. J Hered. 1999;90(1); 83–92. Chase K, Lawler DF, Carrier DR, Lark KG. Genetic regulation of osteoarthritis: A QTL regulating cranial and caudal acetabular osteophyte formation in the hip joint of the dog (Canis familiaris). Am J Med Genet A. 2005;135(3):334–335. Marschall Y, Distl O. Mapping quantitative trait loci for canine hip dysplasia in German Shepherd dogs. Mamm Genome. 2007;18(12):861–870. Todhunter RJ, Bliss SP, Casella G, et al. Genetic structure of susceptibility traits for hip dysplasia and microsatellite informativeness of an outcrossed canine pedigree. J Hered. 2003;94(1):39–48. Janutta V, Hamann H, Distl O. Complex segregation analysis of canine hip dysplasia in German shepherd dogs. J Hered. 2006;97(1):13–20. Mäki K, Janss LL, Groen AF, Liinamo AE, Ojala M. An indication of major genes affecting hip and elbow dysplasia in four Finnish dog populations. Heredity (Edinb). 2004;92(5):402–408. Pfahler S, Distl O. Identification of quantitative trait loci (QTL) for canine hip dysplasia and canine elbow dysplasia in Bernese mountain dogs. PLoS One. 2012;7(11):e49782. Fels L, Marschall Y, Philipp U, Distl O. Multiple loci associated with canine hip dysplasia (CHD) in German shepherd dogs. Mamm Genome. 2014; 25(5–6):262–269. Lavrijsen IC, Leegwater PA, Martin AJ, et al. Genome wide analysis indicates genes for basement membrane and cartilage matrix proteins as candidates for hip dysplasia in Labrador Retrievers. PLoS One. 2014; 30;9(1):e87735. Friedenberg SG, Zhu L, Zhang Z, et al. Evaluation of a fibrillin 2 gene haplotype associated with hip dysplasia and incipient osteoarthritis in dogs. Am J Vet Res. 2011;72(4):530–540. Feldman G, Dalsey C, Fertala K, et al. The Otto Aufranc Award: Identification of a 4 Mb region on chromosome 17q21 linked to developmental dysplasia of the hip in one 18-member, multigeneration family. Clin Orthop Relat Res. 2010;468(2):337–344. Feldman GJ, Parvizi J, Sawan H, Erickson JA, Peters CL. Linkage mapping and whole exome sequencing identify a shared variant in CX3CR1 in a large multi-generation family. J Arthroplasty. 2014; 29(9 Suppl):238–241.